Be at the centre of the action but away from the crowds. 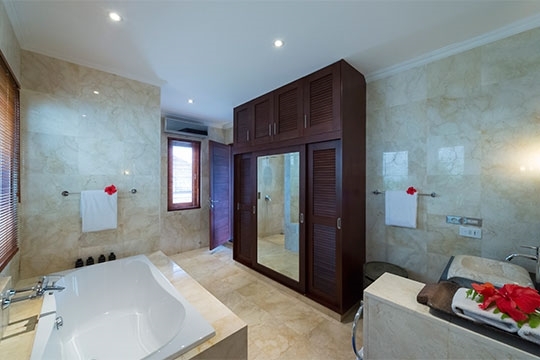 The fully staffed 2-bedroom Villa Kalimaya II has loads of living space, high-spec interiors, private garden with pool, jacuzzi and infra-red sauna, and a killer location just 200m from the beach and Seminyak’s famed restaurants and boutiques. Villa Eshara II is one of three private, luxury pool villas, which can be connected via sliding garden walls to create a chic 8-bedroom option. Fully staffed, 2-bedroom Eshara II is just five minutes from Seminyak's beach, restaurants and shops. Perfect for groups seeking luxury in a central location. Kalimaya surpasses expectation – but maybe there’s a clue in its name – literally, ‘River of Gems’ – for it certainly delivers a free-flow stream of precious experiences that out-sparkle other Seminyak villas. Little wonder then that Hollywood movie stars and royal family members count among Kalimaya’s guests. 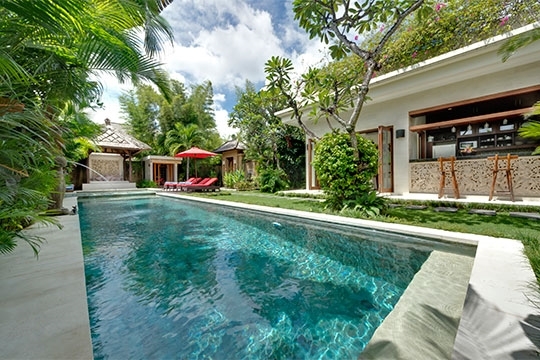 Each of the four two-storey villas in the Kalimaya family – one with two bedrooms, two with three and a five-plus-one-bedroomed villa – is set in its own private walled garden coloured with tropical blooms and cooled by lotus ponds and fountains. Each has an extraordinary amount of living space: not one but two living rooms, a separate dining room, fully equipped kitchen, and large terraces on both levels with teakwood tables for alfresco dining. There’s been no stinting on the furnishings either – plush upholstered sofas, solid teakwood furniture, oriental rugs, blackout curtains, and four-poster beds with super-sized King Koil mattresses and fine cotton bedding. 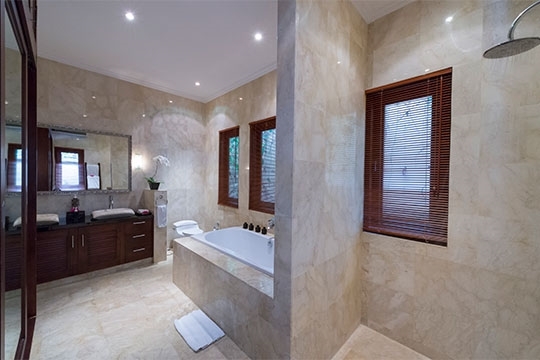 There’s air-con absolutely everywhere, even in the enormous marble bathrooms – so it’s no problem to keep cool while preparing for the Big Night Out. 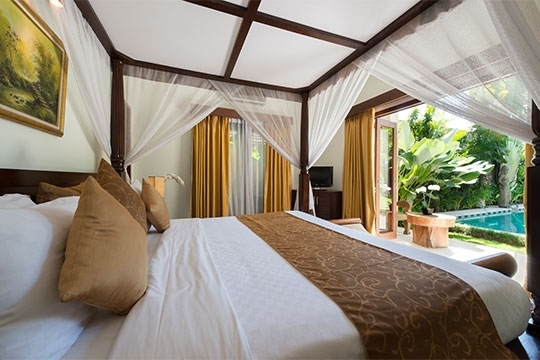 Couples or families would be thrilled with the two- or three-bedroom villas while the five-plus-one-bedroom Villa Kalimaya I is perfect for two families holidaying together. 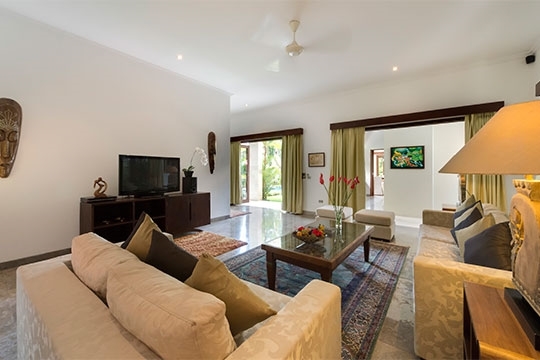 For larger gatherings, such as reunions or wedding parties, the villas can be booked together. 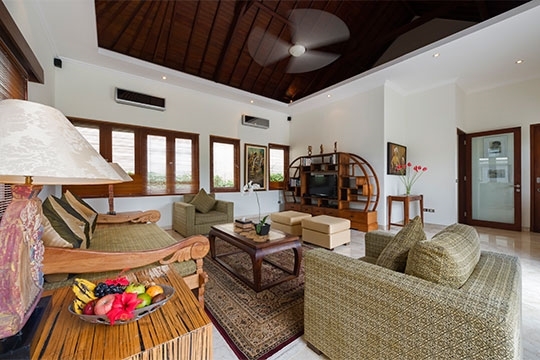 So the Kalimaya villas are a great choice for a family with teenagers, or friends who want to bask in luxury, be indulged by a highly trained team of staff, enjoy the hi-tech facilities, and still be in the thick of Seminyak action. 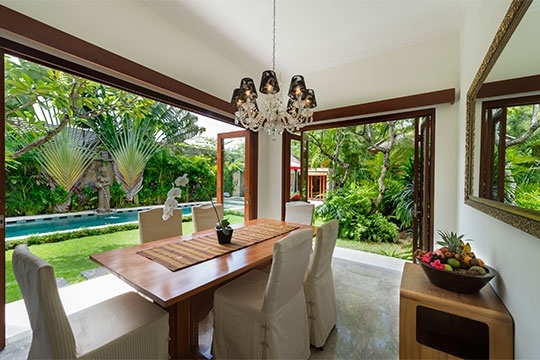 Villa Kalimaya II occupies a prime position in heart-achingly hip Seminyak 200m from the beach and a hop and skip away from the up-market shops and restaurants of Jalan Laksmana. 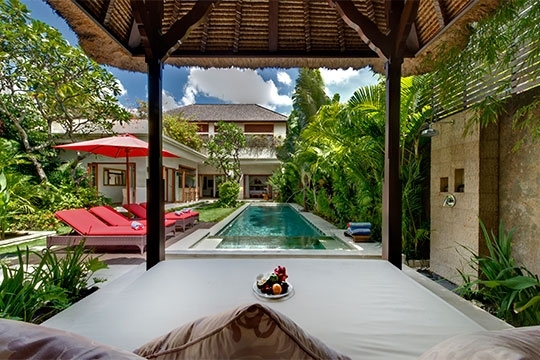 It is one of a small enclave of exclusive private residences – among them, three other ‘sister villas’ of the same name – along a small private lane behind Seminyak Square. The beach is just five minutes’ stroll away, as is Ku De Ta, La Lucciola and the Breeze at Samaya. Other famed restaurants and bars, Sarong included, are also within walking distance. 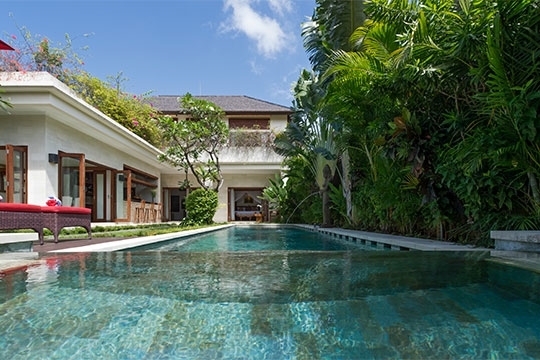 Set within a delightful walled garden with entry across a lotus pond, Villa Kalimaya II is arranged in an L configuration around a large swimming pool edged with statuesque Travellers’ Palms. Housed in a flat-roofed single-storey building, a small dining room with walls of bi-fold glass doors opening onto the garden allow breeze-cooled or air-conditioned dining at a table for six set under a stately chandelier. It links to a handsome, well-designed kitchen where a marble counter with shelf of wine glasses suspended above does double duty as a poolside bar. Teakwood stairs lead up to a second living and entertainment area with another 42-inch TV and, at the far end, the second bedroom and ensuite. Both light-filled rooms have vaulted teakwood-lined ceilings, and walls of glass opening onto a bougainvillea-edged terrace furnished with a parasol-shaded teakwood table – the perfect spot for a private breakfast or sunset cocktails. 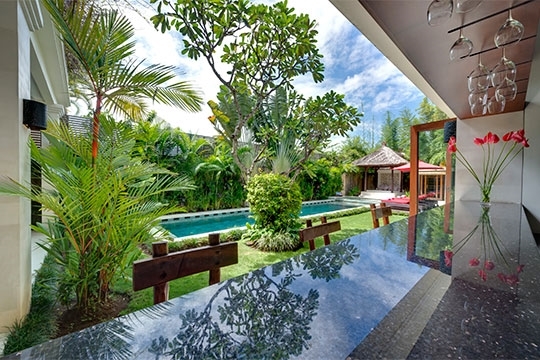 2 bedroom villa located in Seminyak, Bali. Ideal for Beach in ten, City scene, Kid friendly, Romantic retreats, Sensible for seniors, Walk into town, City Scene. 9 out of 10 based on 52 user reviews.